From here at Harrison to Main, four blocks of Water Avenue will be repaired starting right away. 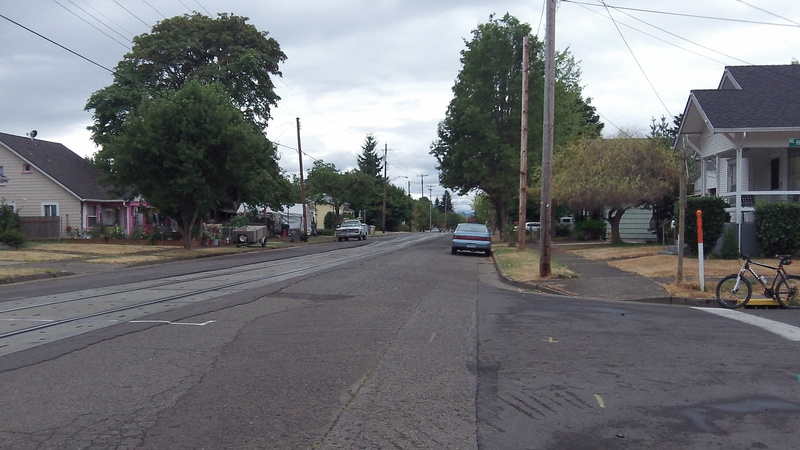 Drivers who use Albany’s Water Avenue have waited for this development for a long time: Repairs on the railroad track running down the middle of the street are about to start and will be followed by restoration of the pavement itself. The city council on Aug. 14 awarded a $168,976 contract to Knife River Corp. of Tangent, which submitted the lower of two bids, for repaving Water Avenue from Main Street to Harrison Street. Public Works Director Mark Shepard says the Portland & Western Railroad, which leases the track from BNSF Railroad, will start rebuilding the track this month. When that’s done, the city’s contractor will do the repaving job. This job covers four blocks of Water from Main Street to Harrison. Shepard says the remaining three blocks from Harrison to Geary Street will be done next year. The paving contract also calls for updating curb ramps to allow people in wheelchairs to use them. From David Moore, via Facebook: That used to be a low trestle; and transients would sleep in it. Some of those timbers might still be down there 4 or 5 feet down; and that might be why it has to be fixed every decade or so – because there is no firm foundation.